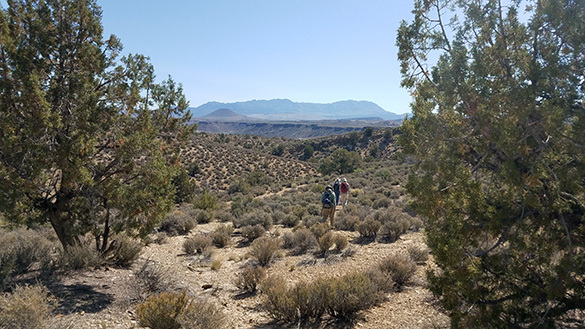 Santa Clara, Utah — Team Jurassic Utah had its first day in the field, and it was excellent. As you might recall from this blog, last month I visited southwestern Utah alone to scout out locations for this crew, and today we began work. On the left is Galen Schwartzberg (’19), in the middle is Ethan Killian (’19), and on the right is our geological technician Nick Wiesenberg. 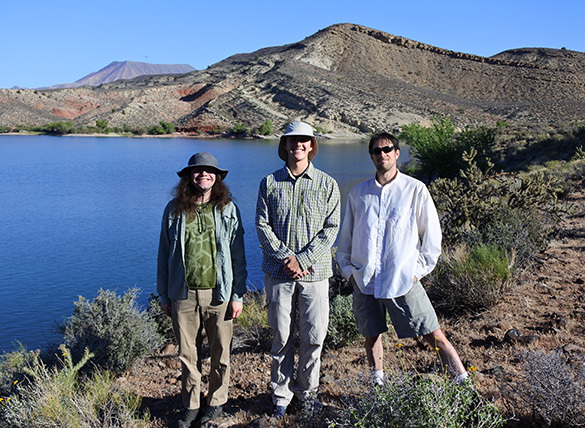 They are at Gunlock Reservoir with the delicious Middle Jurassic Carmel Formation exposed in the background. Note the beautiful blue sky. Perfect geology weather. 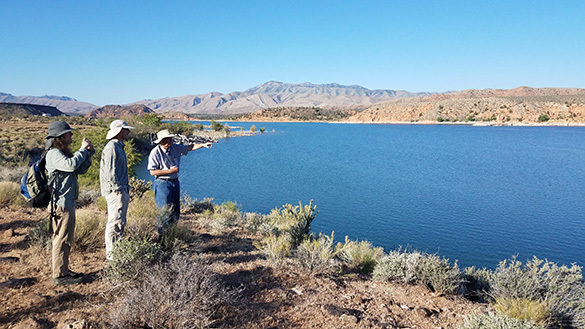 Classic professorial pointing at Gunlock Reservoir. Photo by Nick. 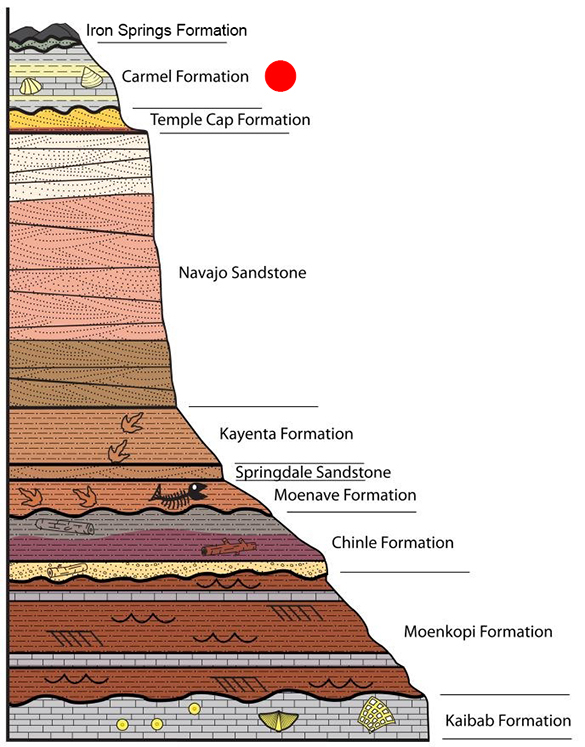 This is the familiar southwestern Utah stratigraphic column, modified after the column on the Zion National Park website. We spent the morning exploring the Carmel exposures around Gunlock. At this point we’re doing orientation and working on observation skills. The students proved to be quick studies with the stratigraphy and paleontology, adding already new ideas and information about the Carmel fossils. No one can resist the fascinating oyster balls of the Carmel (officially they are ostreoliths), so Nick, Ethan and Galen found new horizons and worked out a rough stratigraphy of their occurrence. In some places they are so common they’re stacked up. 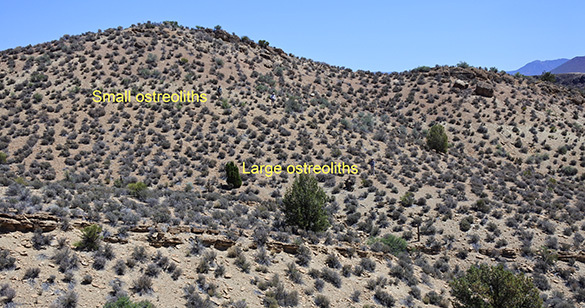 We noted a pattern of shape distribution (spherical vs. flattened), and that the large ostreoliths (up to 75 cm in diameter) seem quite different in origin from the more numerous small ones like those shown above. Here we were able to determine that the large ostreoliths are consistently stratigraphically below the small ones, and there are subtle changes in sediment color enabling us to predict their distribution. It is 12.6 meters from the large to the small ostreoliths, stratigraphically, and 16.9 meters from the small ostreoliths to the base of the Iron Springs Formation. The team tramping through the Gunlock region. Note the landmark conical Veyo cinder cone in the background. Photo by Nick. The Gunlock area we examined in the morning is #1 on the above image. 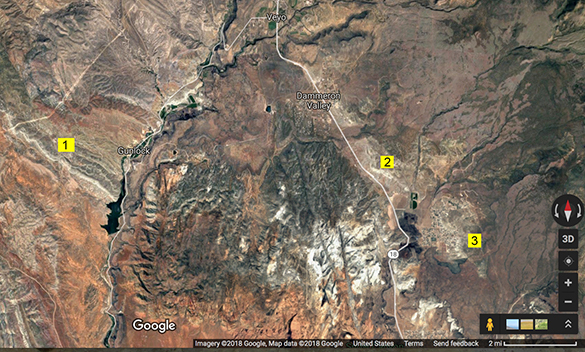 We then drove north through Gunlock to Veyo (top of the image) and turned south on Utah Hwy 18 past the extending Carmel outcrops in Dammeron Valley (#2) to work in the Carmel in suburban Diamond Valley (#3). There we found many shelly fossils, mostly bivalves and crinoids, and numerous tiny encrusters and borings. I ended the day by giving a presentation to the SW Chapter of the Utah Friends of Paleontology at Dixie State University. 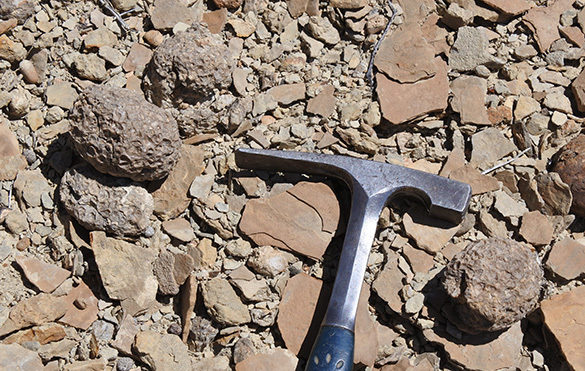 I talked about the origin of oyster balls, oddly enough, and what they tell us about the paleoenvironments of the Middle Jurassic in southwestern Utah. It was a fun and inquisitive group with excellent questions and ideas about some of the remaining oyster ball puzzles. Old Limey writes wistfully: Excellent series of blogs about a very interesting area of Jurassic geology. Congratulations to Ethan and Galen. Please continue to post further details once you are all back in the lab, in order to assuage the curiosity of your international audience. Thank you, Old Limey. I thought of you often on these outcrops and how much you would enjoy them again. I’m very much looking forward to seeing you next month! It’s great that you have been able to obtain permission to collect from some areas that were off limits to us in the 1990s.